Having been handed what amounted to a blank check in the form of the Tonkin Gulf Resolution, the Johnson administration cast about for means and methods with which to fight the war to which it had now committed the nation. The aircraft launched for retaliatory strikes against North Vietnam in response to the second Tonkin Gulf incident were hardly back aboard their carriers when the Joint Chiefs directed CINCPAC and subordinate commanders to execute preplanned contingency operations. Two squadrons of B-57 light bombers were immediately flown from the Philippines to Bien Hoa airfield, some 15 miles northeast of Tan Son Nhut. In the following days, other aircraft were dispatched to Da Nang and Thailand. The JCS drew up a list of 94 targets most critical to North Vietnam’s infrastructure and its ability to support the insurgency in the south. But LBJ had an election to win; for now, any U.S. response would be geared to “maximum results and minimum danger." Meanwhile, the communists had not been idle. On 1 November, a VC mortar squad penetrated the poorly defended Bien Hoa perimeter and set up shop. In the ensuing half-hour barrage, four Americans were killed and another 72 wounded. Five B-57s were destroyed, along with three VNAF A-1s. 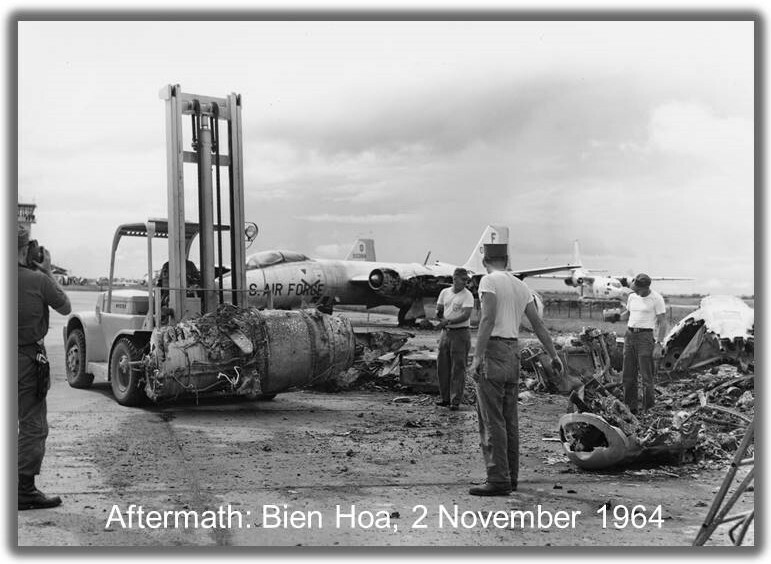 Thirteen of the remaining B-57s were damaged, along with several more aircraft and some buildings. In response the Joint Chiefs, particularly Air Force Chief of Staff Curtiss LeMay, argued for a “fast/full squeeze” bombing campaign against the North, including a B-52 night strike against Hanoi's main airbase. The president, fearful of possible VC terrorist attacks against U.S. dependents on the eve of the election, demurred. LBJ’s landslide November victory for the moment alleviated domestic political concerns, but his advisors nonetheless called for continued restraint. No overt action would be taken against North Vietnam, but efforts to reduce the infiltration of enemy troops and supplies from Laos would be stepped up. This program of cross-border armed reconnaissance sorties by both USAF and USN aircraft, nicknamed BARREL ROLL, would become one of the enduring features of the war. Neither the navy nor the air force, which for the past twenty years had embraced as its primary mission the reduction of the Soviet Union to a heap of radioactive ash, were prepared for the type of mission BARELL ROLL demanded. Results were largely ineffective, and Hanoi remained unmoved. In South Vietnam, yet another government struggled to establish some sort of stability as enemy attacks increased dramatically. On Christmas Eve, 1964, VC terrorists blew up a car bomb underneath the Brink Hotel BOQ, killing two U.S. servicemen and wounding scores of other Americans and Vietnamese civilians. More worrisome was the mauling, a few days later, of a sizeable ARVN force in a protracted, toe-to-toe battle with communist main force units near the hamlet of Binh Gia, 40 miles southwest of Saigon. On the night of 7 February 1965, VC sapper teams made devastating attacks on a U.S. advisory post and helicopter base near the central highlands city of Pleiku. Two days later, 23 Americans were killed in an attack on an army barracks at Qui Nhon. For once, Washington's reaction was swift. Airstrikes were immediately ordered against North Vietnamese installations north of the DMZ, this time including USAF and VNAF aircraft. But once the punch was thrown, much dithering followed. New coup rumors swirled in Saigon as Washington officialdom debated the most effective method of pressuring Hanoi to cease and desist. On 2 March ROLLING THUNDER, the costly, tightly controlled, on-again, off-again bombing campaign against North Vietnam, at last got underway. Having chosen air power as the instrument most likely to convince Hanoi of the error of its ways, the U.S. now recognized an unpleasant corollary: Da Nang, the principal base for launching strikes on the North, was quite vulnerable to attack. Given “the questionable capability of the Vietnamese to protect the base,” American forces would have to assume the responsibility. Immediately after the Pleiku attack, a battery of Marine HAWK anti-aircraft missiles was dispatched to Da Nang, but the far more obvious threat was from ground attack. After discussions with the South Vietnamese—it was their war, after all—warning orders were issued to the 9th Marine Expeditionary Battalion (MEB) already aboard USN transports off the coast. On 8 March, some 3,500 Marines splashed ashore at RED BEACH 2, just northwest of the airfield. In stark contrast to the bloody amphibious assaults which secured the Corps' legacy in World War II, this wave of Leathernecks was greeted by the mayor of Da Nang, reinforced by a contingent of Vietnamese school girls bearing flowers. In actuality, the Saigon government teetered on the verge of collapse. The U.S. had in effect guaranteed the survival of South Vietnam, but had no clear policy or strategy for doing so. ROLLING THUNDER was having no discernable effect on the levels of communist aggression. The Joint Chiefs of Staff recommended deployment of three divisions (2 U.S., 1 Korean) to go on the offensive against the insurgents, relegating ineffective ARVN forces to pacification duties. Others favored an “enclave” strategy rather than trying to root out the VC/NVA through “search and destroy” operations. Da Nang airport was not the only piece of real estate with security issues. About 40 miles northwest lay Phu Bai. “Virtually in Viet Cong camp grounds,” it was nonetheless home to ASA’s 8th RRU—the largest intercept site in the country. Militarily, the Marines thought it would make sense to relocate the site to a more defensible position. But COMUSMACV was not inclined to uproot an already pricey SIGINT operation. A Marine battalion was shortly deployed to Phu Bai. By mid-April, the situation in South Vietnam appeared grim. But there was little agreement, even within the military establishment, as to what should be done about it. 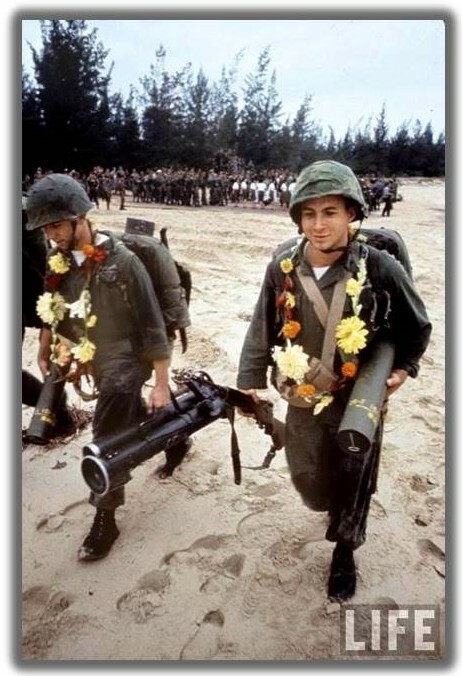 In response to a COMUSMACV request, however, the 173d Airborne Brigade—the Army’s quick reaction force in the Pacific—was cleared for deployment to the Bien Hoa-Vung Tau area. The “Sky Soldiers” were followed by brigades from the 101st Airborne and the 1st Infantry Division. More Marines were landed, as well as advance elements of the Royal Australian Regiment. On 28 July, President Johnson announced that U.S. troop strength in Vietnam would increase to 125,000. Among the new arrivals would be the reconstituted 1st Cavalry Division, created to test the Army’s airmobile concept—the “helicopter war” that would become perhaps the most enduring symbol of the long Indochina conflict. Unacknowledged—indeed disguised—in the buildup were the ASA and Marine Direct Support Units (DSU) attached to the combat units. The Flight Detachment of the 3d RRU, now entering its third year of operations, continued to provide ARDF support throughout the country. In mid-August, ARDF fixed targets associated with the 1st VC Regiment near the rapidly expanding USMC base at Chu Lai. After some convincing by NSA’s Vietnam Representative and MACV J2, the Marines decided to launch a preemptive attack combining a beach landing, helicopter assaults, and mechanized vehicles, all with generous close air support. The resulting operation, unintentionally named STARLITE,* proved to be a hard fight. The VC suffered severe casualties leading, as it would throughout the war, to assumption of a major allied victory. But the Marines faced a tough, determined, and resilient foe. His transmitters were back on the air within days, and many enemy evaded the trap to fight another day. Further south SIGINT, including ARDF, confirmed the presence of the 325th NVA Division in the border regions of the central highlands, seemingly heralding a long expected enemy attack across the waist of South Vietnam, effectively cutting the country in half. In late October, a regiment of the 325th attacked a Special Forces camp about 40 kilometers southwest of Pleiku. An ARVN relief force was promptly ambushed and pinned down. Gen. Westmoreland ordered the 1st Cav and its helicopters to the rescue. SIGINT enabled accurate placement of devastating airstrikes, including the use of B-52s in a tactical role. Blasted by bombing and surprised by the air cavalry, the NVA units scurried back to their Cambodian sanctuary. Westmoreland then ordered the Cav to press the advantage, intending to pin the 33d NVA regiment against a mountain in the Ia Drang valley. As a result of the earlier STARLITE success, five ASA ARDF aircraft had been dedicated to the airmobile campaign. A major enhancement in the form of “one-time” crypto pads now enabled the passing of fix results from the aircraft directly to the DSU, significantly reducing the time required to place perishable intelligence in the hands of the consumer. On 9 November the 1st Cav launched operation SILVER BAYONET which, a few days later, would culminate in the epic battle around landing zone X-Ray, brilliantly described in the best-selling We Were Soldiers Once—And Young. 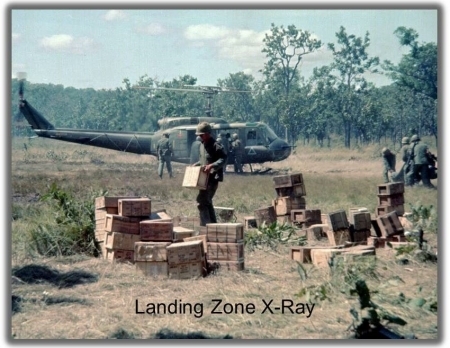 According to an NSA history, the Ia Drang battle was “the first significant test for tactical SIGINT in an ongoing operation.” But, as the history admits, the “Ia Drang was not a totally unmitigated success for SIGINT.” Communications below the battalion level went undetected, perhaps because radios were not used, but in any case with near disastrous consequences. Enemy forces were considerably more numerous than anticipated and while American firepower stopped a potential catastrophe, the troopers of the 1st Cav were hard hit. Worse was to come. A day after the engagement at X-Ray, some 400 men marched out towards a nearby fire base and into a vicious enemy ambush. The column was decimated, with almost 40% killed in action. One company of 112 men suffered 95 killed or wounded. Even so, the enemy had taken far more casualties than the cavalrymen, but the NVA were now convinced that they could stand up to anything the Americans could throw at them. *The operation was intended to be named "Satellite" but a clerk, laboring in bad light, typed "Starlite." Many later works have mistakenly corrected the spelling to "Starlight."